If you visit Disney Donna Kay very often you know of my love of Disney Christmas Ornaments. Today I thought I would share with you which ornaments currently in the Disney Store I would choose for each of us and why. 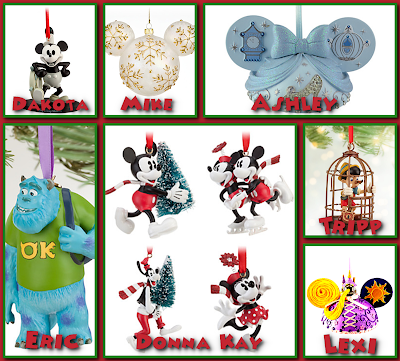 Which Disney ornaments would you choose for your family? Let me know in the comments below or on the Disney Donna Kay Facebook page. I can't wait to hear from you!! We get the one's like Mike each year for our tree. I have a new one coming from a friend of Mike's that went to Disney last month. I can't wait to see it, I just love surprises! !